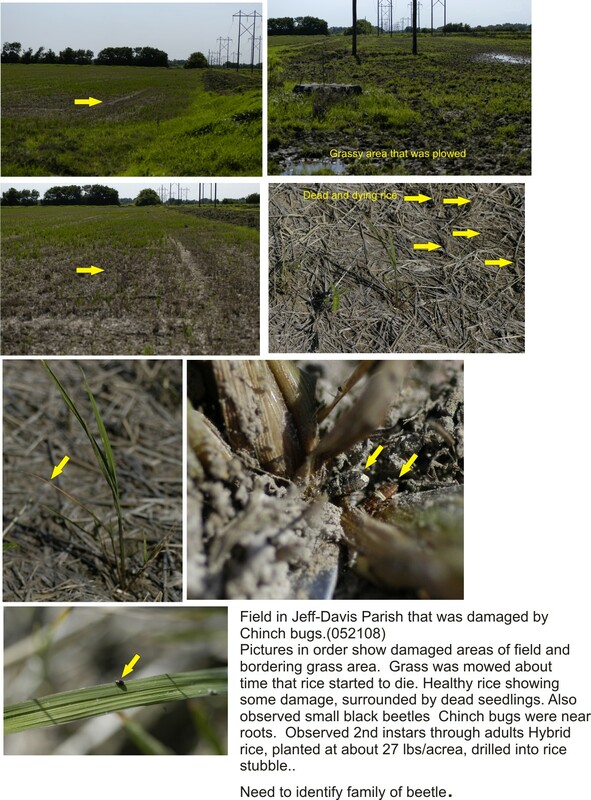 More insects reports from Jeff Davis and Evangeline Parish – chinch bugs, thrips, aphids, and rice water weevil adults. Today I’ve have four calls about insect problems in rice. Yesterday I ran the battery down on my phone between phone calls, e-mails and tweeting field observations. Which reminds me, if you are using twitter, you are welcome to follow me @NatHummel for field updates. 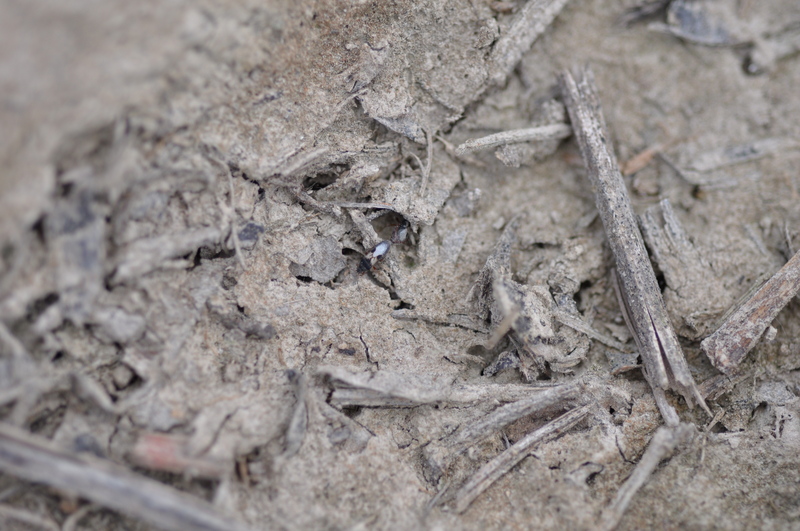 These dry conditions are exacerbating problems in drilled rice, which in many cases is dry, dry, dry. We need some rain. The wind is not helping the situation. 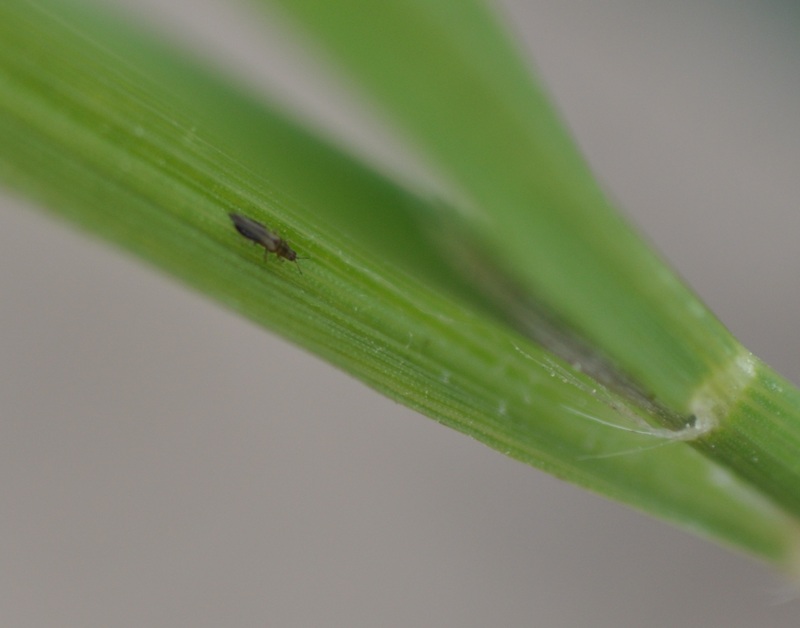 One consultant, who has decades of experience in rice, called today to tell me he would appreciate more training in identification of uncommon insect problems – namely aphids, thrips and chinch bugs. As we shift away from water-seeded to drill-seeded rice these insects have the potential to become more common pest problems. It looks like that might be happening this year. 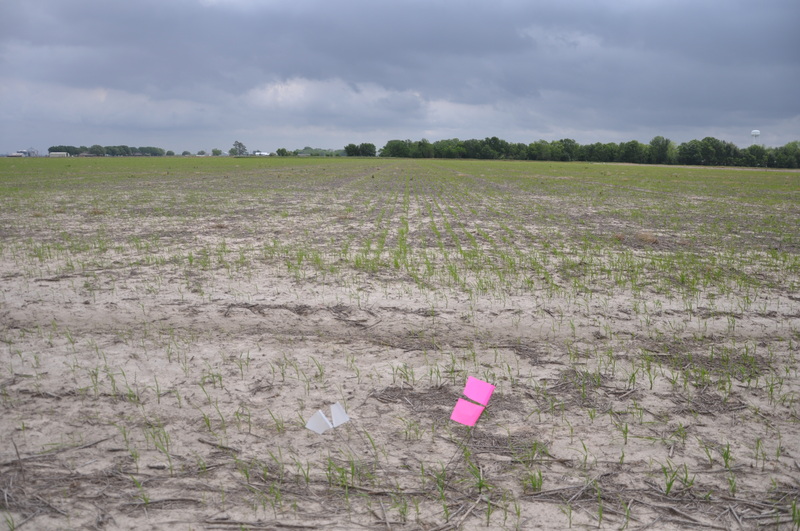 This blog posting will focus on many of those “secondary pests” which we happened to observe in Evangeline Parish yesterday. Before I get to that, just a quick update on what is becoming the chinch bug situation. In Jeff-Davis Parish I have now heard of four additional locations which suffered from infestations of chinch bugs. This brings the count to about 8 to 10 sites with chinch bugs infestations. Some had been treated with Dermacor X-100, but remember Dermacor will not control chinch bugs. CruiserMaxx and NipsitInside should provide control (refer to previous postings about difference in seed treatments for more details). It has been noted that drilled hybrid rice, planted at low seeding rates, needs to be carefully scouted for chinch bugs. 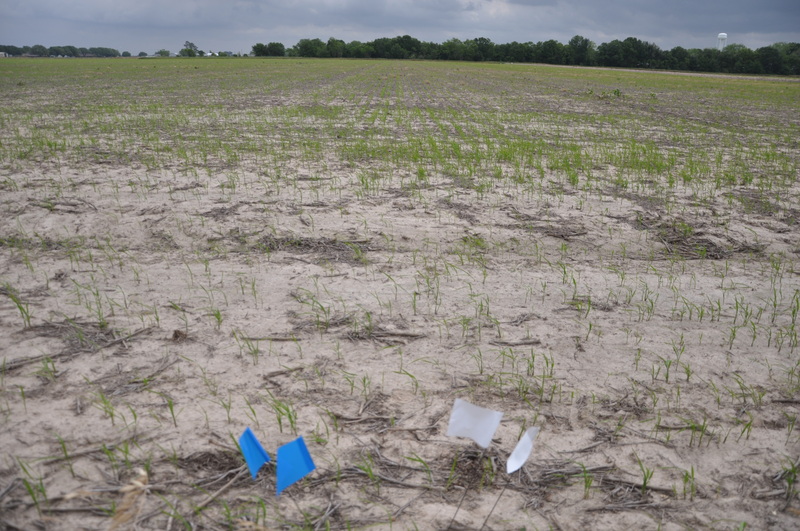 This is true primarily because in a field with a low seeding rate, the number of plants per acre is substantially lower than in field planted at a conventional seeding rate. When an insect (such as chinch bugs) infests a field with few plants to begin with, they can cause substantially more injury more quickly than in a field with a thicker stand. 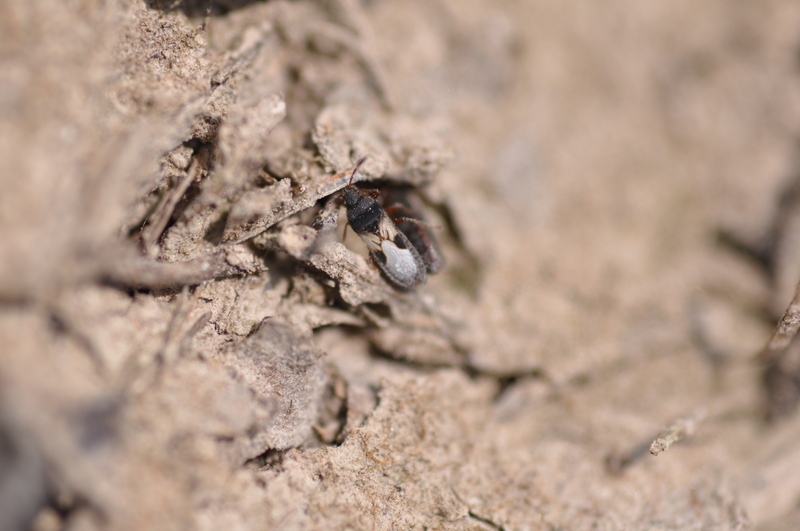 Chinch bugs can be difficult to scout because they have a habit of hiding in cracks during the heat of the day and also because they often feed at the soil line near the base of the plant. This injury caused by feeding on the heart of the rice plant is what causes the rice to throw a red or orange leaf and eventually die from injury. To treat an infestation it is best to apply a flood or flush water across the field and then follow with a pyrethroid insecticide – this strategy drives the insects up onto the plant allowing them to be exposed to the insecticide. You can click on the pictures to make them larger. 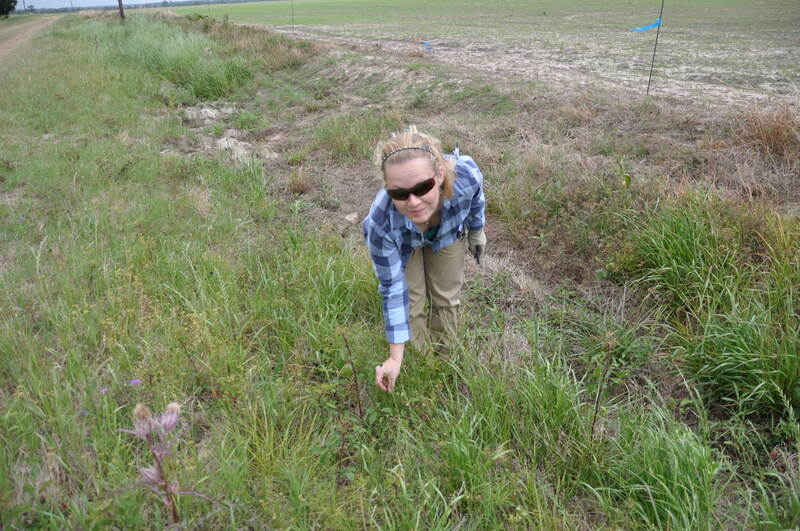 In Evangeline Parish we found a few chinch bugs feeding on the plants. Chinch bug near base of rice plant. We also found a mating pair of chinch bugs on the soil surface between the rows. Just to illustrate how difficult these can be to scout, can you find the chinch bugs in this picture? Chinch bug mating pair on the soil surface. As I was taking pictures, they shifted position – here is a close-up. After mating, chinch bugs will deposit eggs, from which first instar nymphs will hatch. 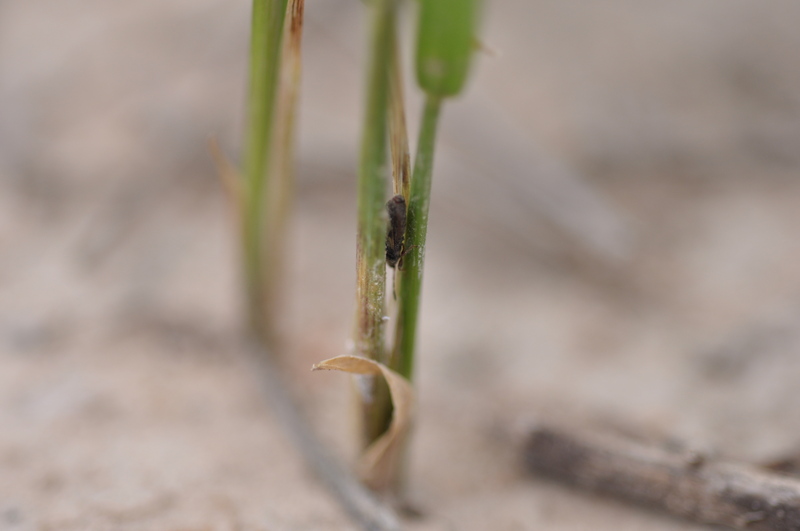 We did see some first-instar chinch bugs near the base of the plant. The first instars look very different from older stages – are very small and bright orange in color. Here is a composite picture from my files for your reference – these pictures were taken in Jeff-Davis Parish a couple of years back. 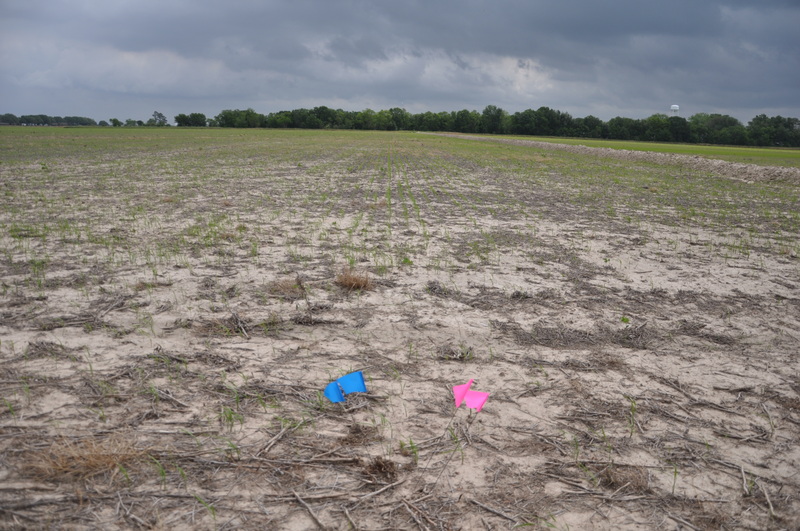 Yesterday, Anna and I took stand data at the Evangeline Parish Demo test site. 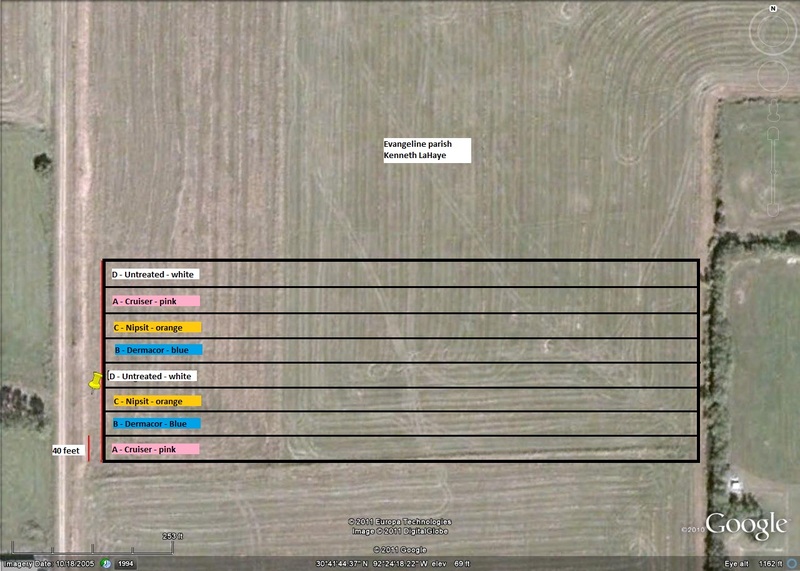 Here is the field map. (I’m in the process of building LSU AgCenter websites for each of the test sites, but suddenly time at my desk is precious and rare). The field is located between Ville Platte and Vidrine at these GPS coordinates: 30°41’42.66″N, 92°24’23.80″W. 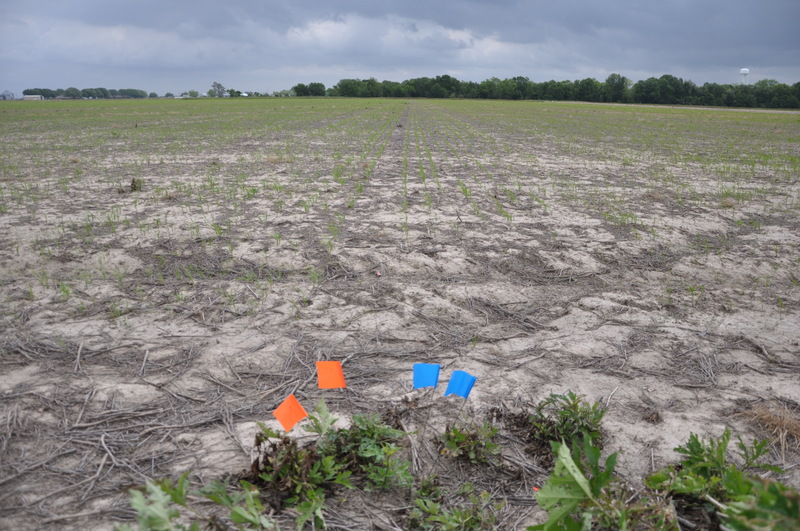 The plots are flagged with colored flagging according to treatment. The variety XL745 was planted at a 25 pound/acre seeding rate on March 21, 2011. First emergence was noted on April 5, 2011. Yesterday, we visited the site two weeks after emergence to take observations on the stand. At this location we are comparing the three seed treatments (CruiserMaxx, Dermacor X-100 and NipsitInside) to an untreated check. In general, there does not appear to be a significant difference between treatments, but the untreated cuts do not look quite as vigorous. 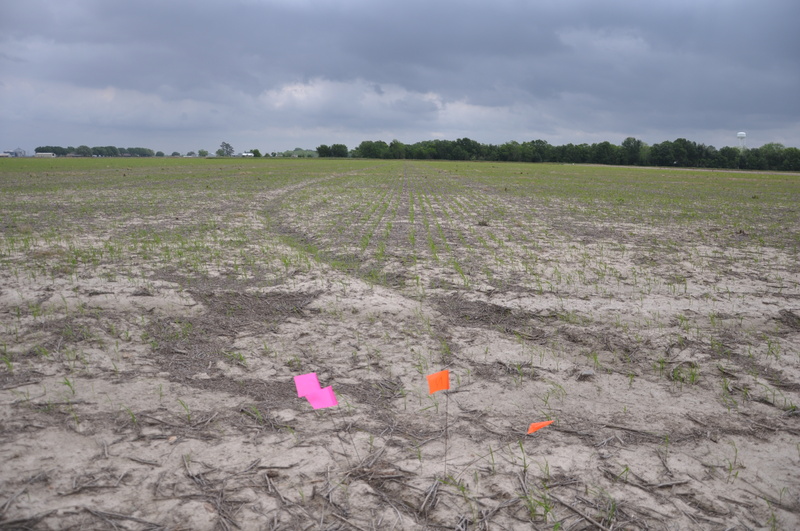 We will wait to summarize all the stand count data from all sites before making definitive statements about any effect of seed treatments on the stand vigor. Following is a series of field shots comparing the treated strips. Plants grown from Dermacor X-100 treated seed to the left and CruiserMaxx treated seed to the right. Plants grown from NipsitInside treated seed to the left and Dermacor X-100 treated seed to the right.Plants grown from untreated seed (fungicide only) to the left and NipsitInside treated seed to the right. 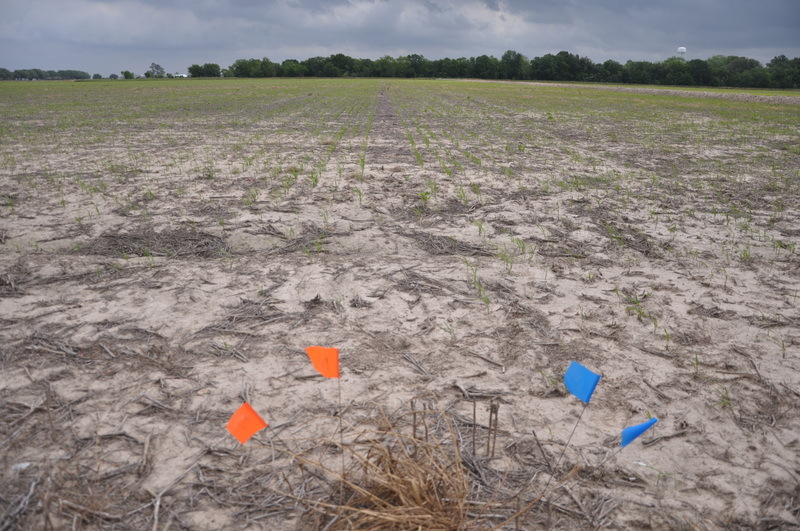 Plants grown from Dermacor X-100 treated seed to the left and untreated seed to the right. Plants grown from NipsitInside treated seed to the right and Dermacor X-100 treated seed to the left. Plants grown from CruiserMaxx treated seed to the left and NipsitInside treated seed to the left. Plants grown from untreated seed to the left and CruiserMaxx treated seed to the right. As we walked across the field site we noticed many fire ants and also parasitoid wasps, which led us to believe there must have been some insects in the field that these predators/parasitoids were consuming. Sure enough, after some searching we started to find aphids, thrips and chinch bugs. None are present at levels that are causing noticeable injury in the plots, but we will certainly keep an eye on the populations. 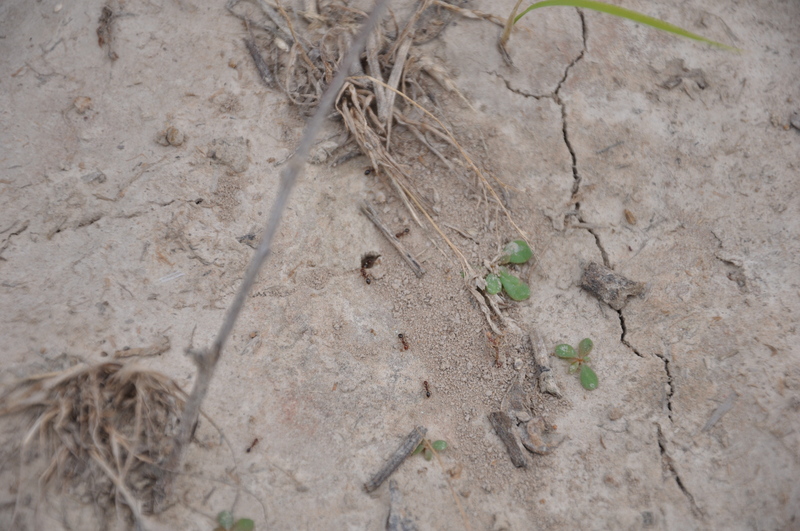 Fire ants foraging in the Evangeline Parish test site field. 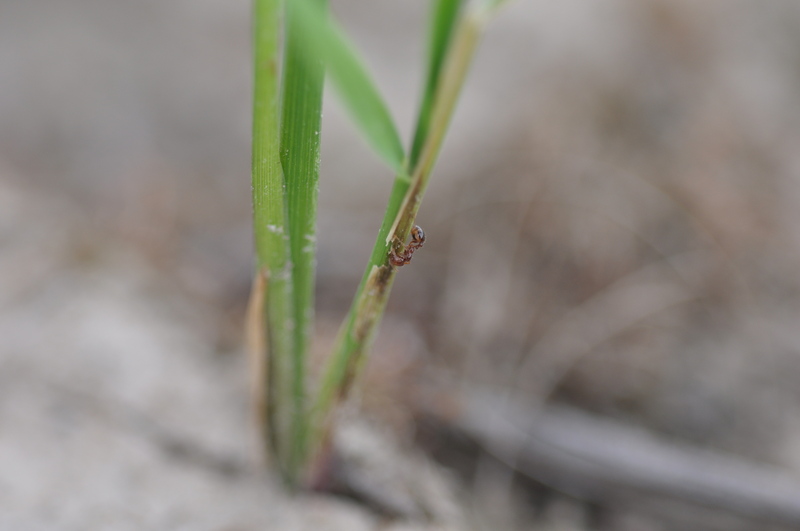 In this situation, the fire ants are helping us by eating some of the insects that are attacking the rice – including aphids, thrips, and possibly chinch bugs. Of course, they also took a couple of bites out of me as I was attempting to take picture in the windy conditions at the field. Fire ant foraging for insects infesting a rice plant - in this case, it looked like it was searching for thrips. 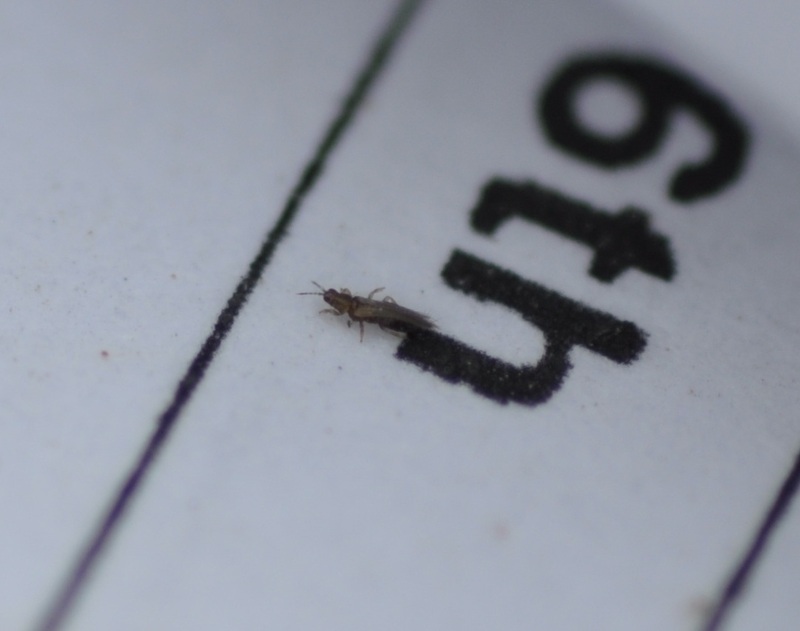 Thrip on a datasheet after it hopped off a rice plant. The datasheet is printed in 10 pt font, so you can see the miniscule size of the thrip adult. 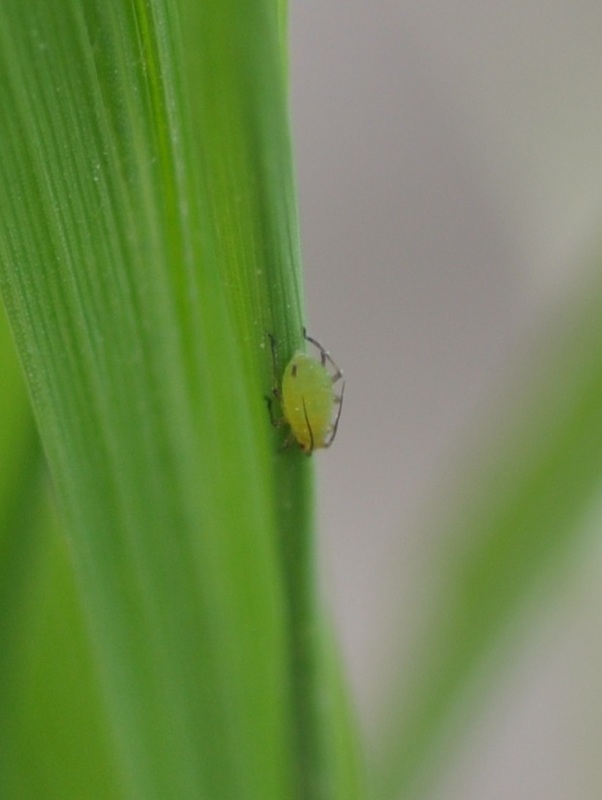 Thrip adult on a rice plant leaf blade - we commonly found them on the blade or in the leaf sheath area. It appeared that feeding injury was causing discoloration on the sheath, but this was not confirmed. We found a few aphids on some of the plants. It is likely that populations would be higher if they were not being attacked by ladybugs. 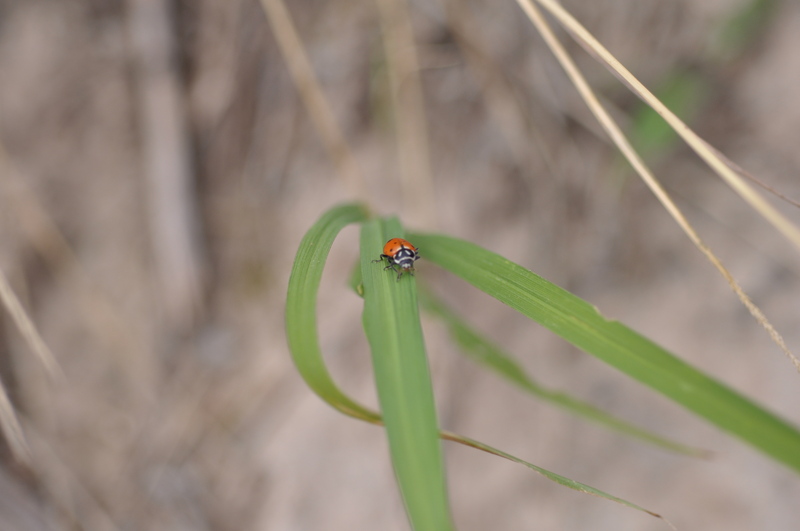 Ladybugs were also present in the field eating the aphids. The herbicides had not gone out yet, they will probably go out today, and so we took a few moments to enjoy a sweet gift of nature – wild blackberries on the edge of the field. Tomorrow we will make some site visits in Jeff-Davis where possible colaspis injury has been reported. In the afternoon, we will head to St. Landry Parish to take stand counts at our demonstration site.